SpaceX's first Falcon 9 rocket to launch in 2014 sits atop its launch pad at Cape Canaveral Air Force Station in Florida for a planned Jan. 6 launch. The rocket will launch the Thaicom 6 communications satellite. Private spaceflight firm SpaceX is blasting a telecommunications satellite into orbit today (Jan. 6), and you can watch all the fiery action live online. A SpaceX Falcon 9 rocket carrying the THAICOM 6 communications satellite is slated to launch from Florida's Cape Canaveral Air Force Station today at 5:06 p.m. EST (2206 GMT). 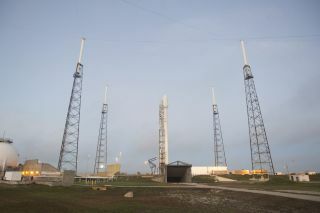 You can watch the liftoff live here on SPACE.com beginning at 4:25 p.m. EST, courtesy of SpaceX. If all goes according to plan, the Falcon 9 will deliver the satellite to its geosynchronous transfer orbit about 31 minutes after launch, SpaceX officials said. The 6,650-pound (3,016 kilograms) THAICOM 6 satellite will provide telecommunications and broadcast services to people throughout southeast Asia. The spacecraft was built by Virgina-based aerospace firm Orbital Sciences for Thaicom, a company based in Thailand.